Recruitment and Retention! It's our Job. The Chicken or the Egg? Recruitment or Retention? Which comes first? Obviously for us, we need to recruit to have a steady supply of teachers to replace those who are retiring or leaving the profession. We are gearing up for another exciting, interactive National Teach Ag Day. There are so many ways to participate & share your passion for teaching ag! The live webcast will stream from 1:00-3:00pm EDT. Visit the Teach Ag website for more information. Prior to the live webcast, you can interact & join us for all kinds of celebrations! Click on the links below for more information on how to participate in this fantastic event! Join us before the live webcast for an interactive live learning session about biofuels. Biofuels 101 will stream live on Thursday, September 22nd from 11:00-11:45am EDT. You will have the opportunity to learn about the latest trends in the biofuels industry, as well as engage with industry professionals. Each year, the National Teach Ag Campaign selects a group of individuals to recognize as Teach Ag Champions. This year we want YOU to help us recognize YOUR Teach Ag Champions by submitting pictures or a 10-second video of those individuals who make your career as an ag teacher possible. One of the first things someone needs in order to teach agriculture is a degree in agricultural education. 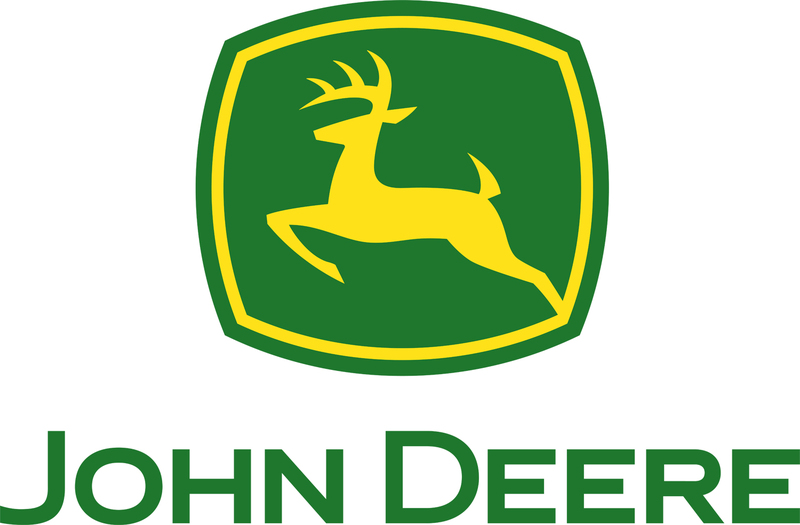 The National Teach Ag Day Collegiate Commercial Contest provides college students the opportunity to promote their respective college or university and agricultural education program through a 20-30 second commercial. Twenty-three future agriscience teachers will participate in three days of professional development and networking as part of the 2016 National Teach Ag Day celebration. Make sure to tune in to the live webcast & see these five schools as they celebrate with us! National Teach Ag Day is a great opportunity to share with others your love for ag education and passion for teaching! Here are some ideas for hosting your own party. Have a student who wants to follow in your footsteps? Submit a photo of a future ag teacher to Tabitha Hudspeth by September 12th. Make sure to include their name, school, state, and the name of his or her agriculture teacher. Take TONS of pictures & send us YOUR Snap Story on SnapChat so we can see and feature all of the awesome things you are doing to celebrate with us! Make sure to follow Teach_Ag on SnapChat!! Looking for more ideas to celebrate National Teach Ag Day? Visit our website for links to lesson plans, games, activities & much more for your use as you celebrate with us! 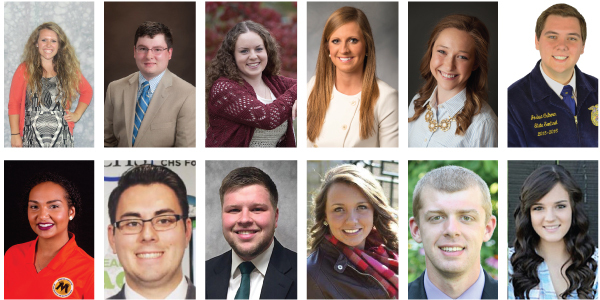 Meet the 2016-17 Teach Ag Ambassadors! We have a great group of ambassadors gearing up for National FFA Convention. The future of ag education looks very bright with this outstanding group of preservice teachers! 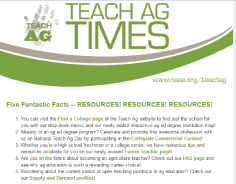 Subscribe to Teach Ag Times & New Teacher News! Agriscience is agricultural education that draws out the science elements already present in agriculture. Often, a hallmark of agriscience programs is the rigor of the academic concepts presented. However, a long-treasured aspect of agricultural education is its ability to reach learners of all levels. Bonifas teaches her students about caloric intake and metabolism through this innovative idea. Her students calculate their Basal Metabolic Rate (BMR) and determine the amount of exercise needed to maintain their weight, based upon the food choices they make. This lesson can be applied to food science and animal science courses for an inside look at the importance of proper nutrition and exercise. Click here to watch the video! 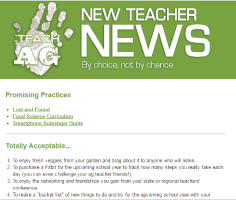 In the Teach Ag edition of News & Views, we wanted to take the opportunity to showcase several individuals who have made it their top priority to serve as mentors to other agriculture teachers, both formally and informally. These teachers are outstanding examples of what it takes to bring attention to the career of ag education, get students thinking about a possible career in agricultural education, and support current ag teachers in their careers. The New & Improved Communities of Practice! We will have several opportunities for training related to the new site, including live webinars, workshops at NAAE convention, and special small group trainings as requested. For more information, contact Julie Fritsch.Visit communities.naae.org to see the new site! Award winners have been notified and travel plans are being made. If you are a NAAE award winner and have not been contacted, please email Katie Wood immediately. Early bird registration has ended. The advance registration cost is $385 through 10/28. Start planning your convention experience with Sched! See an outline of what is going on and customize your calendar. Check out the Early Bird Housing discount before September 30th! The NAAE Board of Directors conducted their summer board meeting July 28-29 in Lexington, KY.
We are pleased to announce the twenty individuals who will participate in the year-long NAAE XLR8 professional development program aimed to accelerate their ag teaching career. Greetings from Washington, D.C.! From construction on the Metro, to multiple lockdowns of the Capitol, and even the 111° Fahrenheit heat wave hitting the Capitol City this week, I can say I have survived them all. Are you running for NAAE office? New candidates for regional vice presidents, along with regional secretaries, committee chairs and secretaries, and new committee members need to fill out and submit their MOU to NAAE by September 15th. Please send your application to your regional vice president, postmarked by September 1. 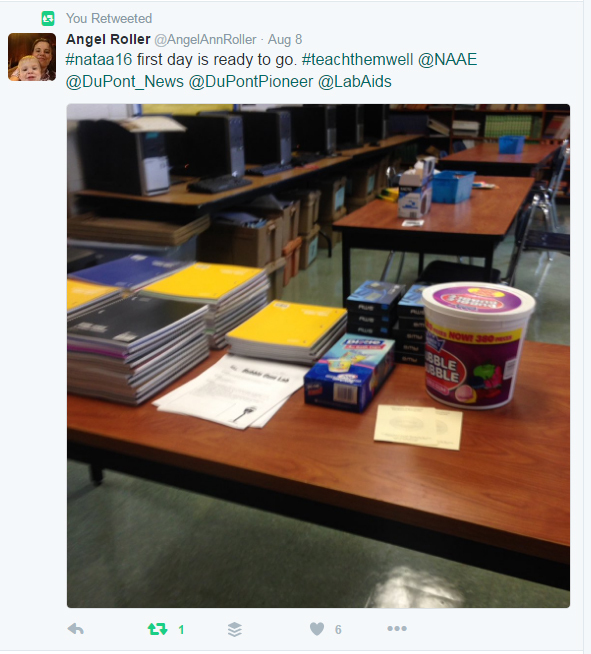 It sure has been a productive summer for NAAE! We are well underway preparing for National Teach Ag Day, National FFA Convention and NAAE Convention. From new Perkins guidance to ESSA College and Career Ready resources, and the announcement of the Reach Higher Career App Challenge, stay up to date with what is going on in Washington. Hi everyone! My name is Tabitha Hudspeth and I was selected to serve as the 2016 National Teach Ag Campaign Intern. 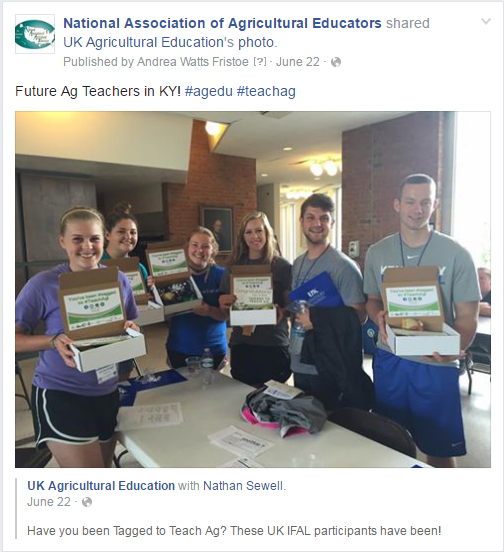 This summer I was able to travel from Brookland, Arkansas to Lexington, Kentucky and work closely with the Teach Ag Team. Curriculum for Agricultural Science Education (CASE) is always looking to improve its resources for agriculture teachers. CASE Online, designed to maximize instruction for both teachers and students, is one of the newest additions to the numerous CASE resources and offerings. Here is a quick look at what is going on in your organization…. NAAE is hard at work planning and preparing for the DuPont Agriscience Institute at NSTA regional conferences, DuPont Agriscience Institute at National FFA Convention, and National Agriscience Preservice Teacher Program at National FFA Convention. 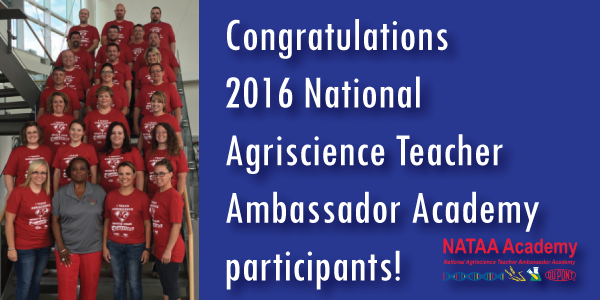 NAAE is also working on the National Agriscience Teacher Ambassador Academy, planning for the Future Agriscience Teacher Symposium at National Teach Ag Day, and arranging the professional development workshops for NAAE Convention. We have also recently completed an overhaul on the Communities of Practice professional networking site that has resulted in mobile access, better search, and all-around increased functionality. Be sure to stop by at http://communities.naae.org and check out the new changes. Don’t forget to stop by the NAAE booth (#2172) while you are at National FFA Convention! CASE is finalizing certifications for this summer. There are now over 1,400 teachers certified in a CASE course and teaching in their classroom! They are also preparing for National FFA Convention and NAAE Convention, as well as their staff meeting the last week of September. Up next is a course development meeting for Mechanical Systems in Agriculture (MSA) course, which will be hosted at Firestone November 3-5. Orders placed by CASE teachers are quickly being processed, so you should receive your supplies and equipment soon! Make sure to visit the CASE booth (#2165) during National FFA Convention! Teach Ag is gearing up for yet another fantastic National Teach Ag Day celebration. Mark your calendars to celebrate with the campaign on September 22nd. The live webcast is hosted by Growth Energy at POET Headquarters, in Sioux Falls, SD. Make sure to tune in live from 1-3pm EDT. There will also be a live, interactive learning session titled, Biofuels 101, which will stream live from 11-11:45am EDT on National Teach Ag Day. They are also preparing for National FFA Convention. 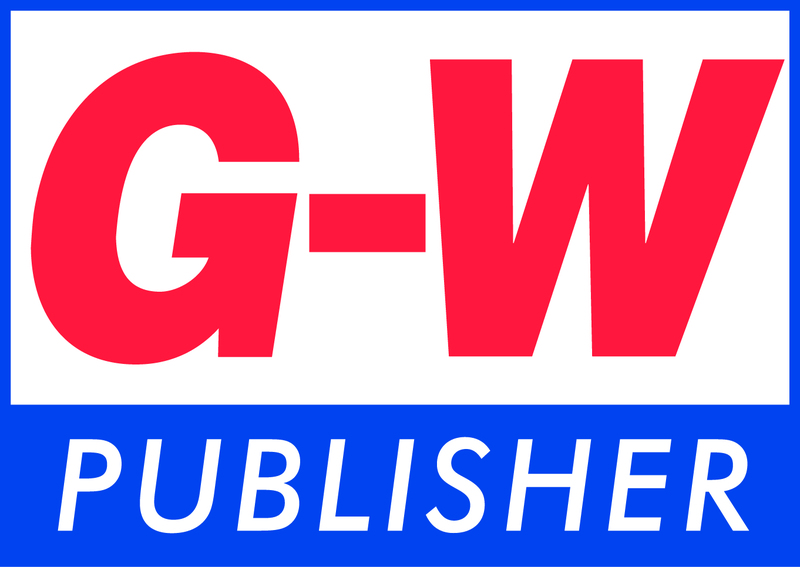 Stay tuned for more information and make plans to visit the booth (#2455) while you are in Indianapolis! Krista Pontius has been teaching agriculture in Pennsylvania for 19 years. She is currently an ag teacher at Greenwood High School. A graduate of the Pennsylvania State University, she attributes her decision to become an agriculture teacher to her own agriculture teacher, who still serves as a mentor for her. Pontius enjoys helping others, which she learned from her parents. Giving back and serving as a mentor and resource for others is a major part of who she is as an ag teacher and individual. “I love helping people! I really feel that giving new teachers a leg up makes our profession stronger,” said Pontius. 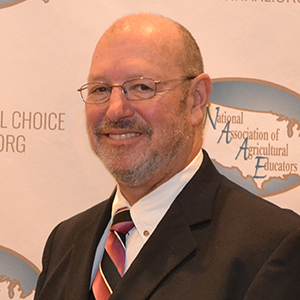 For the past 13 years, Pontius has served as the mentoring coordinator for the Pennsylvania Association of Agricultural Educators’ teacher mentoring program. She works with individuals at the Pennsylvania State University to match new teachers with experienced mentor teachers in their local areas. In addition, she also develops a yearly calendar for new agriculture teachers which includes important dates, mentoring focus areas, a general to-do list, and “Just a Good Idea” advice. Her advice for new teachers is to focus on being a good teacher, never be afraid to try new things, learn from your mistakes and understand that you do not have to do everything. Matthew Eddy has been an agriculture teacher in Iowa for the last 18 years. He currently teaches at Southeast Polk Community Schools. Eddy graduated from Iowa State University with both his Bachelor’s and Master’s degrees. Eddy became an agriculture teacher by chance and stayed in the profession by choice. He enjoys learning new things and applying what he knows from his own personal farming experiences in his classroom. “In the midst of my first teaching job, I realized that aside from the subject matter of agriculture - I really enjoyed helping others, learning new things, and being autonomous in my daily endeavors,” said Eddy. Eddy has worked with the CASE curriculum since 2009 – a pilot program for the Principles of Agricultural Science -- Animal Institute. He also helped develop the curriculum for Introduction to Agriculture, Food, and Natural Resources (AFNR). As a CASE Lead Teacher for five institutes, he serves as a mentor for new and aspiring agriculture teachers looking to implement the CASE curriculum in their own classrooms. His advice for new teachers is to be a voracious learner – learn all you can, from everywhere you can, and everyone you can. Teachers don't need to know everything, but need to be able to know where to find everything. Dr. Robin McLean has spent her career as an agricultural educator in the state of New Jersey, both in and out of the classroom. Currently, she teaches at Northern Burlington County Regional Middle School. She has been teaching since 1998, but took a four and a half-year break to be the New Jersey FFA Specialist. McLean attended Cornell University, where she received her Bachelor’s degree, Virginia Tech, where she received her Master’s degree, and most recently Rowan University, where she received her Doctoral degree. “When I started teaching, it was through other teachers helping me that I began to understand the skills, tips and tricks needed for teaching that I did not learn in college,” said Dr. McLean. McLean is noted for conducting teacher workshops, with her most recent ones focusing on implementing new technology in the classroom. From using iPads in the classroom to developing a professional learning network, Dr. McLean uses these workshops to teach others as well as herself – a key component of professional development. “The most rewarding part of helping other agriculture teachers is developing relationships with them and hearing how they are possibly using some of the tips and tools that I have shared,” added McLean. Her advice for new and aspiring ag teachers is to never be afraid to ask for help and to understand that help may come from somewhere you were least expecting it. She also wants new teachers to understand that it is important to try new technologies and strategies in the classroom one or two at a time. If they work, use them to the fullest, if not, accept it and move on. Morris Armstrong has been a mentor for North Carolina agriculture teachers for decades. After 35 years in the profession, he retired as the agriculture teacher at North Edgecombe High School. His passion for agriculture and love for the classroom was so strong that he even came out of retirement for a year to teach agriculture at Northampton High School, after which he again retired. Armstrong is a proud graduate of North Carolina A&T University, where he received both his Bachelor’s and Master’s degrees. He also received his National Board Certification during his career. With a background in farming, along with the encouragement from two influential teachers of his own, Mr. James Dickens and Mr. Charlie Batten, Armstrong found his place in ag education. “I thought, this is a pretty good career, so I went for it,” said Armstrong. Through his love of students, teaching and FFA, Armstrong has inspired many agriculture students within the state of North Carolina to go on and pursue their own degrees in agriculture and agricultural education. As a mentor for so many, Armstrong has honest and valuable advice for new and aspiring agriculture teachers. Without great mentors like these individuals, agricultural education would not be where it is today. Who is your mentor? Why are they the best? How can you make sure your own influence is as great as theirs? Make sure to thank your own mentor, especially now that National Teach Ag Day is just around the corner! Jessica Grundy, the Region I National Agriscience Teacher of the Year, was selected from among her peers for a variety of reasons, but one of these was her ability to reach learners of all levels and create an inclusive environment, where lessons are tailored to students with a variety of learning styles and abilities. Grundy, who teaches at Wayne High School in Bicknell, Utah, makes it her priority to see that each of her students find where they fit in the classroom. As a participant in the National Agriscience Teacher Ambassador Academy, Grundy has taken her new knowledge and skills around implementing inquiry-based learning to develop modified curriculum that meets each of her students’ individual learning needs. In each of her classes, her students write their own textbook. This allows each student, regardless of learning level, to customize his or her learning, and experience success in her classroom. Her higher-level learners can use their customized notebooks to dive deeper into topics, while her lower-level learners are also accommodated and able to understand the concepts presented. “Not every student’s expectations are the same. I figure out each of my students learning styles and adjust my curriculum to their individual needs. By switching my curriculum to a student created textbook, it has allowed me the opportunity to better individualize their learning,” said Grundy. This color-coded system also helps her students associate each color with a particular piece of knowledge, which is an important part of reaching every student in her classroom. Although differentiating instruction and accommodating all student learning levels can at times seem daunting, it is an essential part of developing an inclusive environment for all students. Ag teachers are like second parents for many students, so developing an inclusive atmosphere in the classroom is essential for each student to find his or her fit. 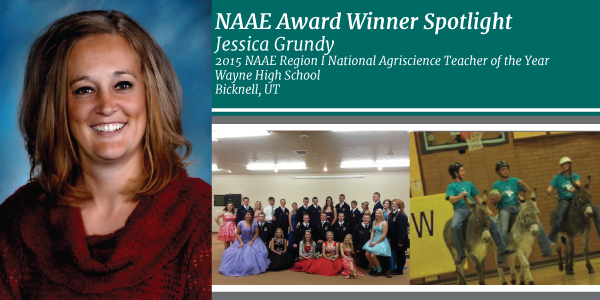 Jessica Grundy is the 2015 NAAE Region I National Agriscience Teacher of the Year award winner. The National Agriscience Teacher of the Year award recognizes teachers who have inspired and enlightened their students through engaging and interactive lessons in the science of agriculture. The 2015 National Agriscience Teacher of the Year award is sponsored by PotashCrop, as a special project of the National FFA Foundation. For more information about this award and to see the other 2015 winners, click here.